I’ve posted some of this information previously, but this is a good summary. Please read as it will affect you. Keeping the dialog going is an important step in raising awareness. I think people just don’t get it by tilmit happens to them. And if they see it happen to someone else, it just doesn’t have the impact because of entertainment, such as movies that show explosions and people getting hit but not really becoming disabled for it, and because in major sports, it is not really covered in the media because the ones covering it haven’t experienced a brain injury and the symptoms of that are written about are thus minimized. 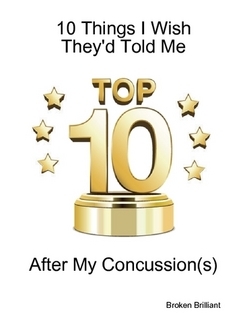 I am paraphrasing Dr. Omalu (who discovered CTE, or chronic traumatic encephalopathy) that we give people with broken bones 6-8 weeks off, but barely even 1 (or 2) for people who have had a concussion. I think that calling a concussion what it is, i.e. a brain injury can begin to make more of an impact on those who have it and need to take it seriously as well as those who hear about it and don’t understand all of the consequences of having a blow to the head directly or indirectly. I totally agree. It’s very strange that we won’t take a break for our brain, but a broken arm buys us time off. And you’re right — people don’t get it, till it happens to them. It’s just very individual and very mysterious at times. But I guess that’s what keeps us on our toes.